Jose Bautista is back. After a horrendous April which saw him post just a .185/.298/.333 line, the Jays’ star has surged. He’s following up a .257/.342/.552 May with a a .258/.413/.774 June, including an absurd 10 home runs in 18 games. Bautista’s resurgence has come with a return to what elevated him to the game’s premier power hitter back in 2010: get the ball in the air often and with authority. Bautista’s power surge in 2010 was accomplished in large part by rarely hitting the ball on the ground. After having ground ball rates over 40% every season of his career, Bautista only hit 31.1% of his balls in play on the ground in 2010. 2011 saw a jump up to 36.9% but still far below his former career norms. 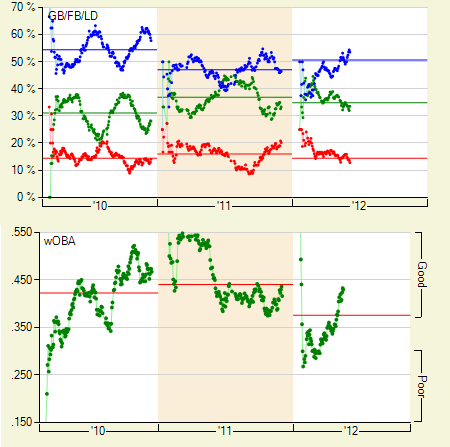 Compare the progression of the blue fly ball line with the wOBA line in the following chart. 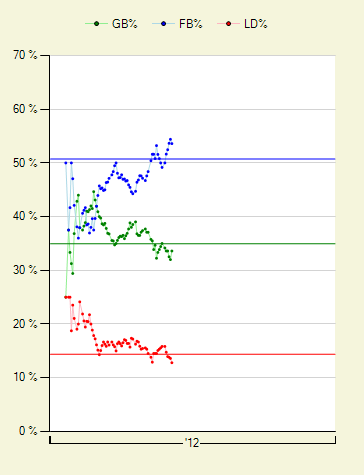 The correlation is obvious, and his current surge is reminiscent of his best power-hitting days of 2010. With a lot of hitters, it’s natural to use stuff like line drive rates to see if they’re going well. With some, it’s tempting to see if they’re driving the ball to the opposite field. Bautista’s approach doesn’t work this way. He’s not a “pure hitter.” He opens the hips and tries to crush the ball. For so many who don’t have the kind of raw power he owns, this approach wouldn’t work. But Bautista’s pull power is so good that it doesn’t matter that he eschews the opposite field. His home run spray charts almost exclusively cover left field; he doesn’t need to cover right field to produce. It takes tremendous ability to make an approach like Bautista’s work. 119 home runs since 2010 have proven he has more than enough power. Now that he’s getting the ball in the air again, we’re seeing the same insane numbers we’ve marveled at the past two seasons. We hoped you liked reading Jose Bautista Elevates In Hot Streak by Jack Moore! .193 BABIP with a 138 wRC+… insane. I guess mashing tons of homers will do that for you. Doesn’t hurt that he’s got a 14.9% BB rate to go along with all that power. Never been a high BABIP guy though. Just .233 in 2010 vs a 166 wRC+. In 2011 it’s .309 BABIP with a 181 wRC+. xBABIP is .272, though. I believe that this qualifies as unconditionally insane. He’s got 22 home runs out of his 58 hits. HRs are subtracted out of BABIP, right? No wonder it’s so low then. Almost half his hits aren’t included in the formula because they go for home runs. He has almost as many singles (28) as he does home runs (22). That’s crazy. That’s true. BABIP only counts balls in play. In 2010 and 2011, roughly a third of his hits leave the park.